"Recessionistas rejoice!Anthropologie stores around the country are hosting a series of reinvention workshops, teaching shoppers how to get more out of the existing items in their wardrobes. Past seminars have been devoted to making hair accessories, wrapping packages with scarves, reinventing plush toys, refashioning blouses and revamping last year's gloves and hats. To find out when the next one is in your area, check with your local store." Now, for me, this is not a viable spending deterrent, as merely stepping foot inside an Anthropologie store at this point is pretty much a recipe for disaster, but it's a cool idea nonetheless, no? 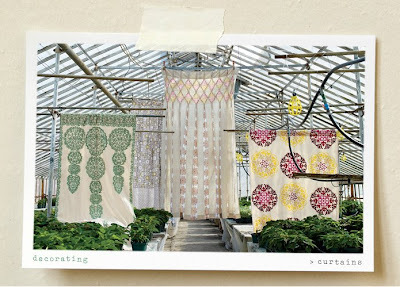 It's a great idea, but I am going to stay away as far away as possible from anthropologie! too tempting. Love this idea, but I agree I'm not too sure about stepping into Anthropologie... that's just a recipe for more spending! I heard about this but didn't realize they were going forward with it. I think it's great, but yes...a spending disaster to occur! anthropologie telling its customers to cut spending?? they're the reason we're in the wonderful rut! lol. gosh i love that store. does it still count for the spending hiatus if you buy something with a gift card?